Descubra a famosa beleza de uma das mais icônicas praias da Itália, com excursão de um dia inteiro pela Costa Amalfitana a partir de Sorrento. Viaje em um minicoach com ar-condicionado ao longo de espetaculares estradas costeiras, parando para visitar as três vilas mais populares e belas da região - Positano, Amalfi e Ravello. Com dicas de seu guia experiente, aproveite o tempo de lazer em cada cidade para passear por ruas estreitas de paralelepípedos, comprar produtos artesanais exclusivos ou talvez jantar à beira-mar. Enjoyable, interesting Amalfi coast trip. Highly recommended. Well informed by Roberto. Highlights were boat trip at Amalfi and street food lunch in Amalfi. Great opportunity to see different parts of that beautiful coastline with its stunning views. This tour was very well organized. The company picked us up on time as promised. They kept in constant contact with me regarding pick up times. The guide Roberto was wonderful. Very knowledgeable and professional. The Amalfi Coast is beautiful. Each of the towns were quaint and charming in their own way. Our only complaint was was a side effect of the windy road. It wasn’t anyone’s fault but if you suffer from motion sickness, BEWARE! This road (especially in a bus) will leave your stomach churning. My partner (26 years) and I (24 years) enjoyed the full day bus tour of the Amalfi Coast. 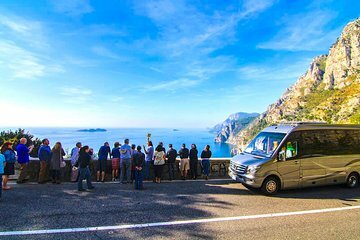 The luxury Mercedes bus collected us from a hotel nearby to our accommodation on time and drove the scenic route to Positano, then on to Amalfi and Ravello. The benefit of having a small bus was the ability to traverse narrower paths than larger coaches were able to, and therefore to experience varied and incredible vistas. The bus driver was very capable of navigating the winding terrain and the host was amusing and knowledgeable, and spoke through a well projected microphone to the eight guests on board. There was ample free time afforded in each location, though you could easily spend longer in each (and any less time would have been too short), and it was a good opportunity to see a great deal of the coast in one day. The host provided good recommendations for local eateries and sights worth seeing (or not seeing, as the case may be) and it was good fun to associate with other native English speakers after a long time away from home. If you are confident navigating the public transport system, could afford the time (with respect to transfers and layovers), and doing your own research with respect to the history of the locality, this trip could be done for significantly less money but this tour was a neat way of having the obligation for investigation removed and quickly capitalising on limited time to see the gorgeous coastline and coastal towns. The weather was perfect, cool but not cold. The crowds were small. 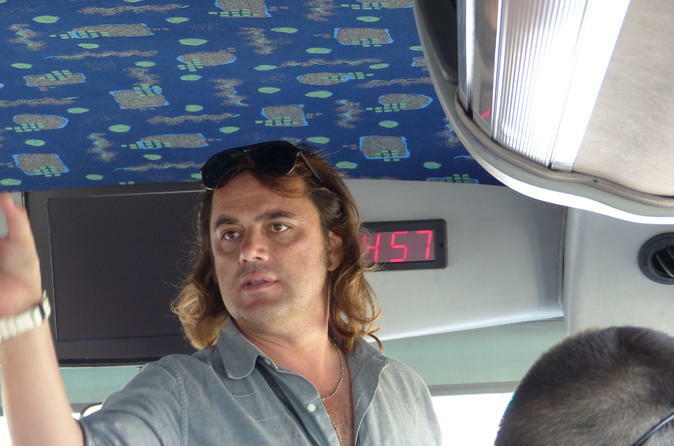 Our driver was great and our tour guide was incredible. I highly recommend this trip! We booked this visit through Viator before leaving the UK. It proved to be an excellent day out, Coach on time, SaSa our guide, was organised, informative and good fun. We visited three small towns which were stunning and also as an addition went on 45 minute coastal boat ride which was also fantastic. Would recommend this trip. It was a reasonably nice trip of Amalfi Coast. With bus ride and boat ride both thrown in. Guide Roberto was well informed and witty. We stopped at Poisatano, Amalfi and Ravello. Each stop was worthwhile, the guide made the time on the bus interesting and the driver managed hairpin turns with amazing skill. I5 was a lovely day. Wonderful way to see all the hit towns of the Amalfi Coast, but it was a bit difficult to hear the guide on the bus, and he could have been clearer. Otherwise well organized- thanks! Our experience with the full day amalfi coast was wonderful! Our guide Roberto had tons of energy and made the trip very enjoyable for us. We also had the opportunity to experience a one hour boat trip around the Amalfi coast which provided us the opportunity to see things you cannot see from the road trip. The only thing I would suggest is on the return trip the people that were riding on the inside and not able to see the coast line going down we’re not provided the same commentary on the way back. I understand it is a lot to go through everything again but to simply remind people of what we passed on the way down on the way up for those who are now on the coast side would’ve been helpful.